Combo for 'the ultimate gaming PC'? Nvidia has announced that its Scalable Link Interface (SLI) technology has been snapped up for license by several of the world's leading manufacturers for their Sandy Bridge motherboards. Intel, ASUS, Gigabyte, MSI and EVGA have all taken out licenses to use it on Intel P67 Express Chipset-based motherboards designed for the upcoming Intel Sandy Bridge processors. Anyone who buys an SLI-certified P67-based motherboard with a Sandy Bridge processor will be able to have a single or a dual combination of NVIDIA GeForce GPUs, including the recently released GeForce GTX 580 GPU and GTX 570 for extra gaming power. Joel Christensen, General Manager of Intel Client Board Division at Intel Corporation, said: "The combined processing prowess of Sandy Bridge and NVIDIA SLI technology will provide consumers with the building blocks for the ultimate gaming PC platform. "Both Nvidia and Intel continue to share a combined passion for furthering the PC as the definitive platform for gaming, and this combination will surely be attractive to anyone building or purchasing a brand new PC in 2011." 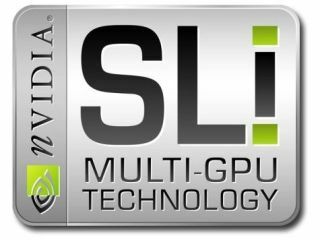 Gamers who have a certified Nvidia SLI mothered will be able to add a second GeForce GPU to their PC, which can possibly double their graphics performance. The GeForce GPUs also include Nvidia's PhysX technology and support for NVIDIA 3D Vision technology that offers stereoscopic 3D on up to three displays.